We received a gift card to shop at the store. As always all opinions are honest and completely those of the JustaBXfamily. 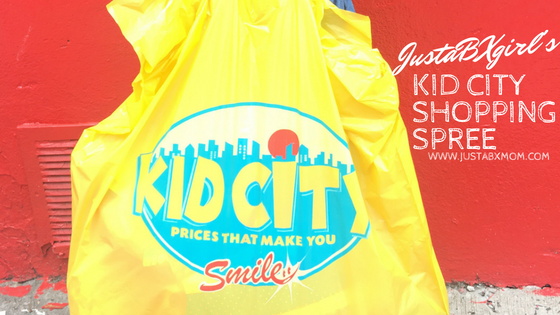 I’ve been shopping at Kid City since before JustaBXgirl was born. It was one of my go-to places for birthday and school shopping for my nephews and now it’s where I turn to get JustaBXgirl ready for school. I can even remember it being the store I ran to when JustaBXgirl came home from the hospital and all of her pants were too big to fit her. My baby was tiny. Every time I walk into the store now I think back to looking through their baby clothes trying to find ones tiny enough to fit my newborn at home. We’ve moved out of the baby section and are now in the big girl area. I love watching my baby girl run through the store looking for items she loves. She always goes straight to the dresses. It doesn’t take her long to find one or seventeen things she just HAS TO have. Fortunately, the prices at Kid City make it easier for me to say yes to the dress(es). On our latest shopping spree, the most expensive item that JustaBXgirl selected was a pair of jeans that were $12.99. Did I mention that those jeans were DKNY?! I love that JustaBXgirl isn’t necessarily a brand name girl. She simply likes what she likes and those jeans happened to have a sequin trim. And that girl loves her some sequins! She loves sequins, glitter, and flowers. All of which she found at Kid City. Don’t worry though. If your littles need uniforms for school then Kid City has that covered too. I told her the clothes she picked out are for school but she’s so excited she keeps trying to wear them already. I remember feeling the same way as a child. Did you rush to wear your new clothes? Do you let your littles wear their school clothes before school starts? My little isn’t quite ready to let go of summer so she also picked up a new bathing suit that she has already worn! I usually don’t like picking up swimsuits at the end of the season because I’m scared she won’t be able to enjoy them next summer. The bathing suit was only $5.99 so if it doesn’t fit next summer I will be completely fine with that. And she can get some use out of it when we head to the Bahamas in November. That’s if she doesn’t go through a growth spurt before then! I’ll be sad when my daughter outgrows them!